Consumers could save over €125 (£112) a year by switching to new LED lights, but some are still not happy. From 1 September, it may be harder to find wasteful halogen light bulbs across Europe as the gradual shift to more efficient LED bulbs continues. Having already conquered the commercial sector, LED lights are now set to take over our homes. This is thanks to a dramatic crash in their retail price in recent years, combined with the fact that they last longer and cost much less to run than halogen bulbs. This is excellent news both for consumers and the environment. 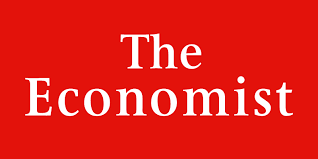 But not for the Eurosceptic British media who have come out to attack the policy, which was agreed by all EU governments in 2009 in order to slash energy waste and household bills. “Outrage as EU to BAN halogen bulbs and make lighting our homes TWICE as expensive,” writes the Sun. “Whose bright idea was that?,” joked the Daily Mail – eight months after they wrote that a shift to LEDs would save people money. To set the record straight, below we take a look at the real benefits of this shift and explain why it matters, leaving political spin and other matters aside. Will you pay more to light your home? The answer is no, consumers will save money, and that’s a fact everyone can agree on. Lightning manufacturer Philips calculated that if households replaced 10 halogen lamps with 10 LEDs, the savings are about £112 (€125) a year. To use an example, we compared the running cost of a halogen lamp with that of an LED lamp and we found halogen is roughly 6.3 times more expensive to run. We also took into account retail prices, which unlike stated in the Sun’s story were roughly the same – £2.50 for the halogen lamp and £2.83 for the LED one. 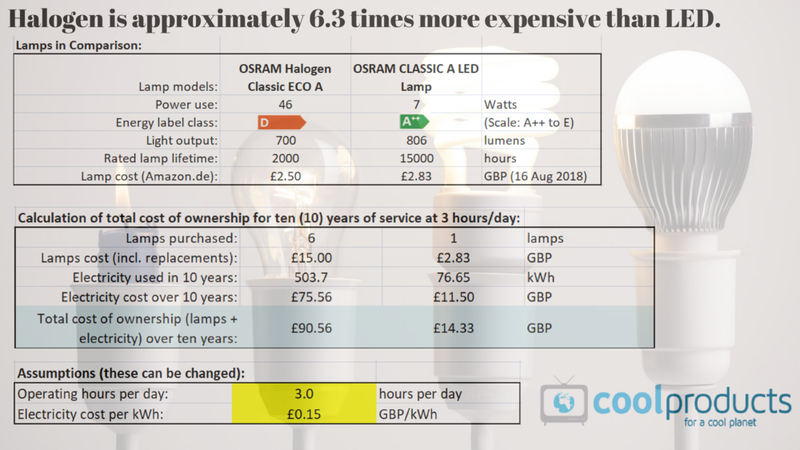 In our analysis, over a ten year time period in a UK home, the halogen will cost over £90 in replacement lamps and electricity bills. The LED, on the other hand, doesn’t need to be replaced and will cost just £14 for the LED lamp itself and all the electricity it’ll use over that decade – while providing the same light. Links to the two lamps compared on Amazon.co.uk: Halogen lamp; LED lamp. In terms of durability, the Energy Saving Trust estimates that a halogen light bulb is likely to last for 2,000 hours of use, while depending on the model LED lamps can last for 15,000 hours, 25,000 hours and longer. Consumer watchdog Which? also recommended shifting to LEDs in 2016. If you have six spotlights in your kitchen, fitting them out with 42-watt halogen spotlights that are as bright as a conventional 60-watt bulb will typically cost you £28.80 to run over the course of a year, they said. But 10-watt LED lights of the same brightness will only add £6.96 to your energy bill. As LED technology continues to improve, retail prices have also halved, with some LEDs now being sold for the same price of their halogen counterparts. Anyone can have a look online and see that, while some remain more expensive, a single light bulb can cost around £2 or £3, roughly the same as some halogens. This is not surprising, given that LED spotlight prices have also fallen by more than 80% in recent years, prompting IKEA to remove halogen bulbs from its stores completely in 2015. Still not convinced? Shops will continue to sell halogen light bulbs until they run out of stock. You can buy as many as you want so you can keep using them as you wish. But who has money to burn like that? Halogen is just plain dumb. What's the ban about and why does it matter? The gradual phase out of halogen technology started in 2016, when EU governments agreed to halt the production and imports of mains-voltage halogen spotlights. The September 2018 phase-out of non-directional halogen lamps covers traditional (pear-shaped) bulbs, which are commonly found in homes and offices. This move is part of the EU’s Ecodesign policy, which gradually removes the most wasteful products from the market by setting standards that demand a certain level of energy performance. The goal is to prevent environmentally damaging products from being sold in Europe, while also cutting energy bills. This kind of action is badly needed, because lighting uses a huge amount of power in Europe – about the same as the residential electricity consumption of France, the UK, the Netherlands, Portugal, and Italy combined. With the earth’s climate situation getting more and more worrying, making products that do the same job using less energy does a lot to help. For this reason, other governments around the world are also working on policies to support and accelerate the transition to LED lighting. The eurosceptic press has repeatedly attacked EU standards in recent years. Driven by politics more than any serious criticism, there are numerous reasons to ignore the hyperbole. But misplaced hostility to efficiency standards is not just nonsensical, it’s also irresponsible as it threatens to derail sensible policies that were put in place to benefit consumers and the planet. This political crusade has had a disproportionate impact on the European Commission, which has stalled and may cut the number of new policy measures adopted. Without these policies, people are prey to wasteful products that will keep our energy bills high and put the planet at risk. Can we as citizens of this planet afford this type of political game? Coolproducts is a campaign led by the European Environmental Bureau and ECOS. We campaign for better products that benefit people and the environment.